The XU4 (Odroid) is the device with which I’ve replaced the AMD64 desktop. It’s a size reduction of about 20x. It’s a weight reduction of about 20 pounds. And, it’s an energy reduction of about 20x, plus or minus. The XU4 boots from the small DOS partition on the uSD. Instead of mounting the rootfs filesystem on the SD, it mounts the one on the USB thumbdrive. This image can be directly copied to an SSD. In this scenario, booting speed is not enhanced. But, everything else proceeds with SSD speed. The USB thumbdrive image is being used only for image creation and testing purposes. The plan is to create the image, transfer it to a nice, fast, USB3/SATAIII SSD, and then expand it. All the thumbdrive needs is a partition table and rootfs file partition. To start the process, I plugged the USB thumbdrive into a Linux PC, and launched gparted. With gparted, I created a normal partition table on the drive, as well as one Linux partition formatted to the filesystem type ext4. I pulled the drive out of the slot, and set it aside. Next, I obtained a uSD that had already been loaded with the XU4 Linux image I’m using. This uSD has two partitions (1 – DOS partition for booting, and 2 – ext4 rootfs filesystem for running). I plugged this uSD into a slot on my FreeBSD powered PC. I unplugged the uSD, and set it aside. I unplugged the thumbdrive from the FreeBSD powered PC, and plugged it into the Linux PC. Why switch back and forth between PCs, you ask? Well, I prefer to use FreeBSD, but it doesn’t support ext4 file systems. After insertion, the thumbdrive wanted to be mounted on the Linux PC. I let it mount. I checked the rootfs file system to make sure it was there. I saw it was OK, unplugged the thumbdrive, and set it aside. I inserted the uSD card into a slot on the Linux PC, and launched gparted. In gparted, I selected the second partition on the uSD (ext4, rootfs) and clicked on the gparted option to change the UUID of the partition. Why? Because the boot.ini in the DOS partition won’t need to be changed, and since the thumbdrive contains the copied ext4 partition (copied from the uSD) – it will already have a UUID that matches the one in the boot.ini boot config file. By changing the UUID on the rootfs (ext4) partition on the uSD, that partition subsequently will NOT be the rootfs file system selected by the kernel, but instead the USB drive’s rootfs will be mounted. All this can be done with no cut-n-paste of UUIDs, but instead just a click to change the UUID of the uSD. I unmounted and removed the uSD card from the Linux PC. I inserted the uSD into the uSD slot on the XU4, and the thumbdrive into a USB slot on the XU4, and applied power to the board. The board “booted” from the uSD boot partition, but mounted the USB thumbdrive to use as the rootfs. Time flies by, and here we are again. The SSD is up and running, and it is FASSSTTTT! (Comparitively speaking, that is). These number were obtained by using the “dd” utility to copy a 500 MB file. I ended up re-creating the partition table and the first partition on the SSD device, in order to make the partition bigger. Then I added a second partition to the same SSD – as an archive data store. I used the “dd” utility to copy the original (partition2.img) thumbdrive rootfs partition into the new SSD’s first partition offset, and then used gparted to increase the size of the filesystem to be fully expanded within the partition. I don’t recommend this as a technique for others to use, but it worked OK for me. It makes the XU4 seem, in many ways, on par with my AMD64 desktop. 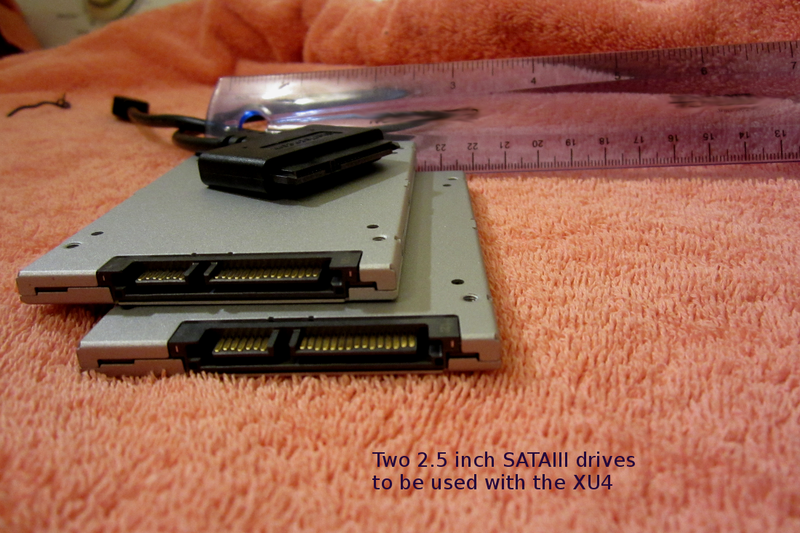 I didn’t bother to purchase an enclosure or case for the drives, and opted instead to use USB3/SATAIII adapter cables to connect the drives to ports on the XU4 (one of the USB3 ports, of which the naked XU4 has two). The drives I used were the least expensive (AFAIK) SSD drives in existence. I wanted to know if they could hold up for awhile. Will they? Dunno, but I’ll post here on any worthy events relative to that issue. What drives? I’m using a pair of the Kingston SUV400S37 128GB SSD SATA-III drives. Kingston is a well known company, but I am not affiliated with them in any way. The drives were purchased on Amazon for about $40 (each). Note: The Odroid xU4 SoC/SBC board discussed here was originally purchased from Ameridroid – the american distributor for HardKernel (http:// http://www.hardkernel.com). FreeBSD is a trademark of the FreeBSD foundation, and they are not affiliated with this author or site in any way. Note: the author does not have a recent, applicable background in circuit building, or battery related issues, so this is presented as the work of a hobbyist, and is not meant for duplication by others. Readers should look elsewhere for design advice and info. Hey, does using a SSD via usb3.0 give better performance results with the XU4 than running the OS off of an eMMC module? Are you using a micro-SD to point it to the SSD or an eMMC (or does this even make a difference)? I am thinking of dropping $25 on a 16gb eMMC, but SSDs are getting really cheap these days with some even within the $15-$30 price range. Are the read and write speeds better? I’ve read that usb3.0 is faster than eMMC. My Raspberry Pi 3.0 performs way better when booting off of my Samsung 32GB USB 3.0 Flash Drive Fit and via usb2.0.. I’m thinking about either using another Samsung Flash Drive Fit on the XU4 or a SSD along with a cheap micro SD for booting versus a 16gb eMMC module. I just want to get the best overall performance really. Any comments or information from your experience? These figures are based on simple dd copy tests. I seem to remember a thread on the Odroid forum that put up some numbers for the eMMC, and IIRC – the SSD figures I’m showing were a moderate amount better than the eMMC figures that the other person supplied in the thread. You might check out the forum. But, I realize now that I haven’t logged into WP in a while, and you’ve probably already made your decision. Sorry.